Just like that, we’re already heading into the last quarter of the year. It seems like just yesterday we greeted each other with ‘Happy New Year,’ and now we’re only a few months away from doing it all over again. Before you get ready for Thanksgiving and the rest of the holidays, make sure you don’t forget one important occasion that is considered to be a tradition among many people; Halloween. Yes, if you’re an avid fan of Halloween you’ll be pretty excited to start preparing your home to scare away trick-or-treaters. If you’ve gotten into the tradition of participating in Halloween the first thing you have to do is to get your lawn ready for the occasion. It doesn’t take much, and a little creativity can go a long way. You can also follow some tips on how you can make your lawn look in tune with Halloween. The good thing about decorating your lawn for Halloween is that you can always go overboard with your decorations. There are no limits to how you want to decorate your lawn. As a matter of fact, the more decorations you have, the more beautiful your lawn will be. But, if you’re decorating your lawn to scare off people you have to remember to make things interesting. This way you can create a beautiful effect on your lawn. When it comes to decorating for Halloween pumpkins are always considered a fixture. This means that they should always be part of the decorations. Pumpkins are something that symbolizes Halloween no matter how much it is used. Traditionally, pumpkins are carved with a face on them. There are even some that have put candles inside these holes to create a ghostly effect. If you would like something different, you can stack pumpkins together to create a new object. This way, you can scare people away from your lawn when they come up to pay you a visit. One of the most brilliant ideas people use is to create a ghostly figure with the help of chicken wire. You can shape chicken wire into a wedding dress and spray paint them. Use a glow-in-the-dark paint so that they will produce a beautiful yet terrifying effect at night. The illusion alone will make people stop in their tracks and believe that they have seen a ghost. Only until they come closer to your lawn will they be able to realize that it’s not for real. If you have a wheelbarrow at home you can incorporate it in your lawn, and then leave around a few fake skeleton bones scattered around it. You can easily pick up some skeleton bones from stores that sell Halloween decorations. By using this decoration your guests will think that you have skeletons in your lawn. Just make sure to remind them that the bones aren’t real, or else they might call the cops on you. Another cool design that you can use for your lawn on Halloween is with the help of a lawn mower. If you have one, you can use it to terrify people into thinking someone was caught underneath a lawn mower. A cool trick would be to have a skeleton body hold the lawn mower while a fully clothed mannequin is lying down underneath the machine. This will fool people into thinking that the dead have come back to life to pay revenge on people. But really, it’s just a fake mannequin that you have put together. If your lawn has a few branches that have already fallen to the ground make sure you gather them for the Halloween season. You can use these branches as a scare tactic for your Halloween lawn decoration without spending a lot of money. The trick here is to paint the gourds white and tie some branches together with the help of a wire. Hang these gourds around your lawn area so that they can frighten people away. Don’t forget to use black paint to create the mouth and the eyes of your ghosts. Halloween is the only time of the year where it is okay to scare people away. 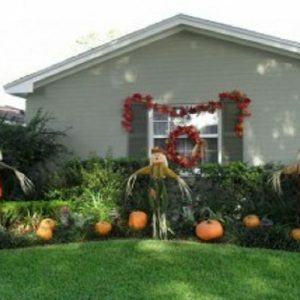 Even if you are joining in on the fun of Halloween season, or you just don’t want strangers to approach your porch you can scare them off with the help of these decoration ideas.